Remember, the EUR25 billion worth of 'Anglo' Government bonds held by the Central Bank after the February 2013 'deal' or swap of Promissory Notes for bonds carries with it a commitment to sell minimum required volume of bonds annually to the market. 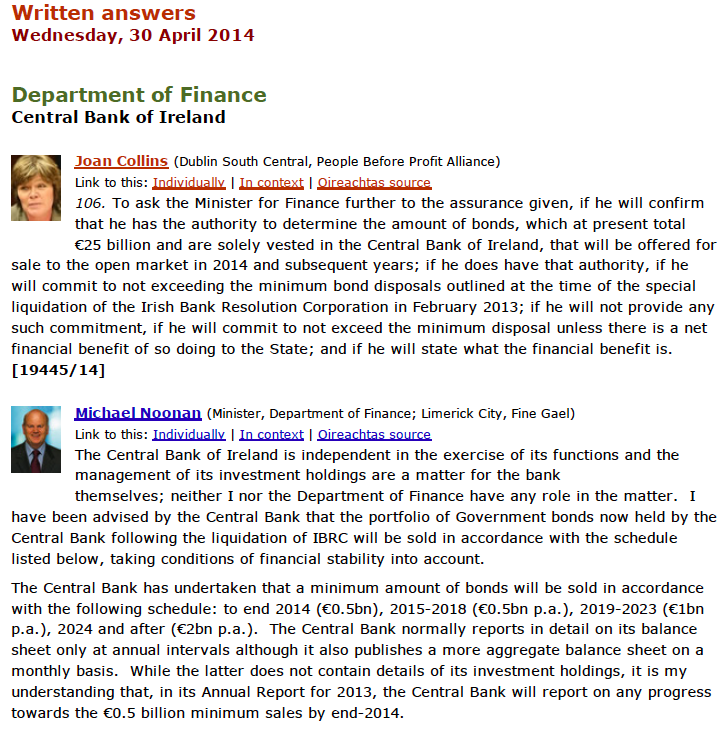 Also, remember, the bonds held on Central Bank balancesheet accrue interest payments from the Government that the Central Bank subsequently 'returns' as divided to the state (having taken its 'cost' margin out to pay for necessary things, like, new HQs building etc). Once the bonds are sold, however, the interest is paid to their private sector holders. It is likely that the yield on Government bonds sold was somewhere around 3%, which means that Irish taxpayers just spent EUR10.5 million in interest payments that were, put mildly, unnecessary. We were not required to sell these bonds in 2013 and could have waited until 2014 to do so. Let's put this into proper perspective: EUR35 million was pledged by the Government this month to help resolve homelessness crisis. Laughably small amount, but still - a necessary gesture from the cash-strapped state. This could have been EUR45 million (or more) should the Central Bank not engage in bonds activism. So why did Professor Honohan go to the markets to sell the bonds back in 2013? The reason is simple: ECB was never too happy with the 'deal' that pushed Ireland dangerously close to using Central Bank to fund the state (IBRC). 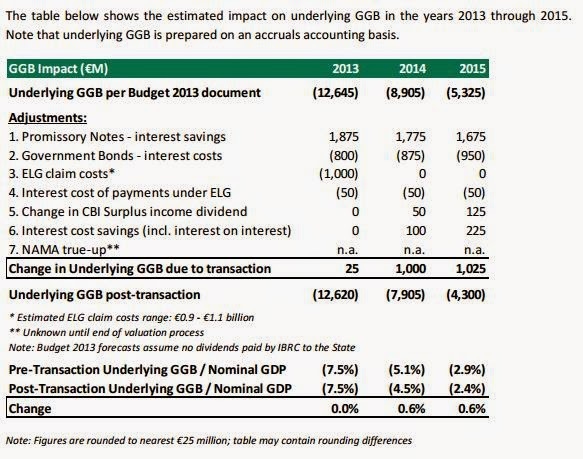 Accelerating sales of bonds pro forma accelerates Central Bank exit from such an arrangement. Alas, happy or not, ECB hardly can do anything about unwinding the 'deal' in practice without doing some serious damage to the euro system. That said, we might see Frankfurt ramping up pressure on CBI to accelerate future sales, once the banks stress tests are fully out of the way - in, say, 2015. That will once again bring to our attention the simple fact that the mess that was IBRC did not go away. Keep in mind that the Government own estimates of the impact of the promo notes deal on government deficits over the short term was the total 'savings' of EUR2,025 million in 2014-2015. Doubling the rate of disposals from current will see this reduced by EUR30 million in two years. More problems are ahead relating to the interest rates. The bonds are floating rate notes, with yield tied to 6 months euribor http://www.ntma.ie/news/ntma-issues-eight-new-floating-rate-treasury-bonds-in-exchange-for-promissory-notes/ reset every six months. The problem is that whilst euribor was running at 0.372% back in February 2013, nowadays it is at 0.410% - a difference of 0.038%, which, over EUR25 billion quantum implies annual interest costs increases of some EUR95 million. Most of this is going to be rebated back to the Government via the Central Bank, but with any acceleration in the sales of bonds, this is also going to get eroded.